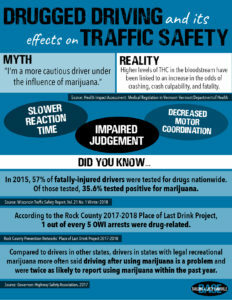 Drugged Driving and its Effects on Traffic Safety | Building A Safer Evansville, Inc.
Research shows increased odds of crashing, crash culpability, and fatality with increased levels of THC in the bloodstream. We’ve all heard that one person who claims to actually drive better under the influence of marijuana. They say they are more cautious, focused, and they drive closer to the speed limit. However, research shows that the higher the levels of THC in the bloodstream, the more likely the odds of crashing, crash culpability, and fatality. Marijuana use is linked with slower reaction time, impaired judgement, and decreased motor coordination. According to the Wisconsin Traffic Safety Report, in 2015, 57% of fatally-injured drivers were tested for drugs nationwide. Out of those tested, 35.6% tested positive for marijuana. The Rock County Prevention Network recently finished their Place of Last Drink project. According to the numbers from 2017-2018, 1 out of every 5 OWI arrests were drug-related. The Governor’s Highway Safety Association compared drivers in states with legal recreational marijuana to drivers in states without. Drivers in states with legal recreational marijuana reported that driving after using marijuana is a problem and they were twice as likely to report using marijuana within the past year. Click the Learn More button to return to the topic page.